As the last week of the baseball season winds down in Chicago, I keep thinking of the number 100. The team on the Southside of Chicago spent over 100 days in First Place (117 days to be exact) before a clearly exhausted Sox club stumbled into second place and missed the playoffs. There were some bright spots, one was a Rookie, Nate Jones, who came out of the bullpen and hit 100 mph on the radar with his blazing fastball. If you were lucky enough to see a great pitching duel like Chris Sale v. Justin Verlander, that’s a game that could take just over an hour and a half, or 100 minutes. On the Northside, it has been 100+ years since the team won the World Series (104 years to be exact), and to add to this misery, the Cubs lost over 100 games in 2012. The number of 100 degree days in Chicago this summer was many, and I can already think of 100 reasons I already miss baseball in Chicago, but looking on the bright side, the return of opening day is in April…which is just a couple 100 days away. As Chicagoans, in many ways we are disappointed with the season’s outcome, but, that is baseball. “It breaks your heart. It is designed to break your heart. The game begins in the spring, when everything else begins again, and it blossoms in the summer, filling the afternoons and evenings, and then as soon as the chill rains come, it stops and leaves you to face the fall alone ” A. Bart Giamatti, Commissioner of Baseball, 1989. The 2012 season was tough on both sides of town, but, we will be back. Both clubs will be back, and so will their fans. In the spring, we will rush to fill the parks once again; we will forgive and forget 2012. We will head out to the ballpark on a crisp, spring day and entering the Diamond will etch the beauty of the emerald colored grass and the brilliant blue sky into our collective memories. You will make your way to your seats, down the Third Base line, you will find the seats are better than you thought they would be. You will be there just in time to make the first pitch and greet an old friend with a warm handshake; he will return the welcome with a cold beer. That’s what being at the park is about, and the park is indeed part of the draw. Wrigley Field, built in 1914 is approaching its …yes…, it’s 100 year anniversary. There is progress towards updating the stadium while still taking care to keep the look and feel of one of the oldest parks intact. There is a digital scoreboard (to complement the original hand operated scoreboard in Center Field), and 100s of flat panel TVs have been installed throughout the first and second levels to ensure fans miss none of the action. Next year, the Cubs plan to add 56 seats behind home plate, moving the stands behind home even closer to home plate. It’s a business, now more than ever, and those 56 additional seats will account for over $1 Million in new revenue for the Cubs next season. (56 seats, 81 home games, 4536 seats at games, at an estimated $225 per seat). With the cost of the game tickets, owners need to keep the current fans, while attracting new ones. 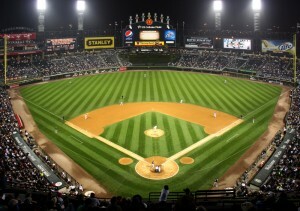 Old Comiskey Park was home to the Sox for 80 years, until it was torn down and replaced by the New Comiskey in 1990. Old Comiskey, like Wrigley Field, had accepted 100s of coats of paint on the walls, which covered the dings, dents and debauchery of 2 Million fans (give or take) a year that both parks endured…and if those walls could talk. Pre-game air is filled with live organ music, piped throughout the park, but don’t get the wrong idea. The game is a long way from a sleepy experience. Baseball has been around for over 100 years, but this is not your Grandfather’s game. It is a sensory overload experience at the New Comiskey before the umpire yells “play ball.” The 37 foot wide x 26 foot tall Jumbotron screen takes center stage and flashes 100 seconds (or so) of Sox glory from teams and players long past. The sound system rumbles the Sox theme song, and fireworks cap off the pre-game pomp and circumstance. As you settle back in your seat for the game, fans record the first moments of the game on their digital cameras, your buddy fires up the tablet to set his home DVR, recording the new Mission Impossible movie he wanted to record before he raced out of his house to the game. Looking around the park, you will find any number of digital scoreboards, displaying the latest happenings from both National and American Leagues. Pitch counts register, and radar guns instantaneously flash how fast pitches are coming in. A fan in front of me draws out his smartphone and clicks into MLB.com to look at Pitch tracks – needs to find the exact location of that last pitch…looked like a ball, called a strike…BOOOOOOO… Those fortunate enough to have club seats watch attendants send food orders to the grill via handheld wireless devices. With the cost of the game tickets, owners need to attract and keep fans. These fans demand an experience. It is the great dichotomy, baseball with a steady, even, and relaxed cadence coupled with the frantic pace and unquenchable thirst for quick, complete information from the fans of baseball. Teams and owners seek to continue to make the fan experience better than being at home watching the game, now more than ever. Take the NFL. Football owners and technology are already moving at the speed of a Defensive End around a lumbering Offensive Tackle. In Texas, the Cowboys have partnered with Cisco to network their stadium. 3000 HD video screens surround fans in the stadium; ensuring fans can freely leave their seats to spend their money at concessions without fear of missing the next big play. A single staff member can control all stadium screens, changing the look and feel of the messaging at the stadium. Moreover, outside businesses can advertise and change their content from week to week with ease. The future of baseball parks and other sports stadiums will increasingly move to meet the needs and wants of their fans, and you can bet the fans will continue to demand more technology, more information and want it faster than it used to be delivered. I can think of 100s of reasons that’s a good thing, especially when you work at a technology company like Molex.